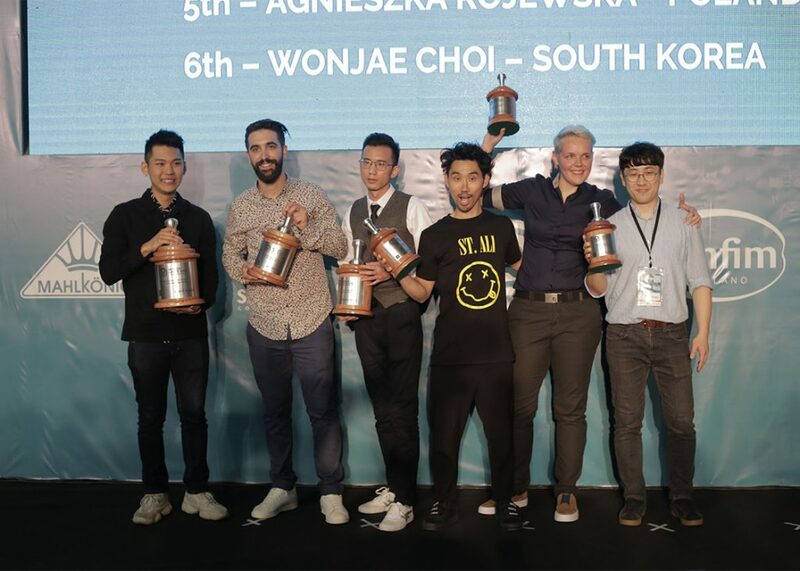 The World Latte Art Championship highlights artistic expression in a competition platform that challenges the barista in an on-demand performance. For the preliminary round of the championship, baristas produce a single creative latte pattern at the Art Bar, then move to the WLAC stage to create two identical free-pour lattes and two identical designer lattes (which allow etching and decoration). Scores from the Art Bar and Stage are combined, and the top 12 qualify for the semi-final round, where competitors make two matching sets of different free-pour latte patterns, and one matching set of free-pour macchiatos. The top six semi-finals competitors qualify for the final round, where competitors make two different matching sets of free-pour latte patterns, and one matching set of designer lattes. The top-scoring competitor in the final round is declared the World Latte Art Champion. Baristas are judged based on visual attributes, creativity, identical patterns in the pairs, contrast in patterns, and overall performance.